When I used the cropping effect to take out the half that I didn’t want, what I got was this result on the left. Hm… that didn’t work so well. It was obvious that the two halves were shot seperately. That is when I decided to try a green screen effect (I happened to have filmed this in front of a green backdrop, which helped). What I got was this result on the right… and it was so much better. To do this, first you need to decide what’s the foreground and what’s the background. In this case, we are going to use Mac and Cheese as the foreground and Bottle Monster as the background. This is because Mac and Cheese is yellow/orange and less similar to the green background than Bottle Monster is. In Adobe Premiere Pro, this means you want to put the Bottle Monster footage in the bottom video layer and the Mac and Cheese footage on top of it. Now select the Mac and Cheese video. 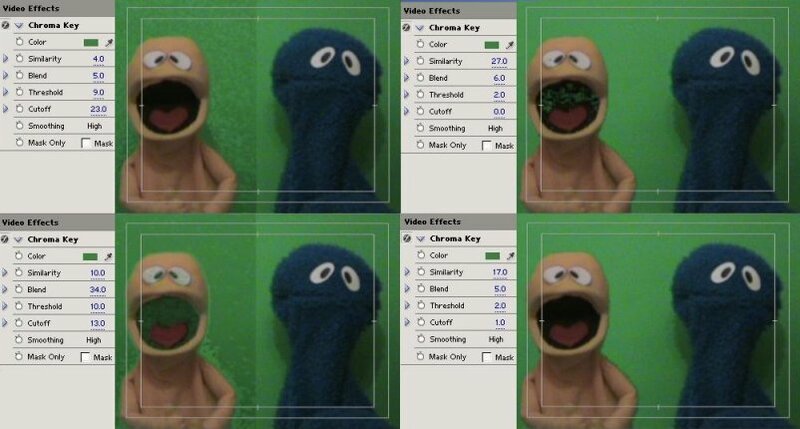 In the Effects window, find Video Effects => Keying => Chroma Key and drag it into the video’s Effect Controls window. 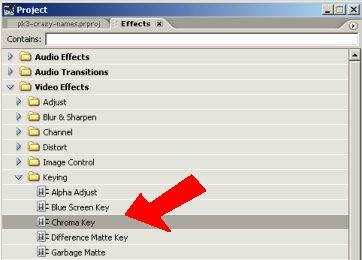 This effect allows you to key out a color you select, in this case, green. Now it’s time to set the variables associated with it. First, use the color picker / dropper to pick the shade of green to key out (make disappear). You might want to pick something that’s in the middle of the darkest and lightest green you want to key out. And then set the other variables. The most important variable here is Similarity. 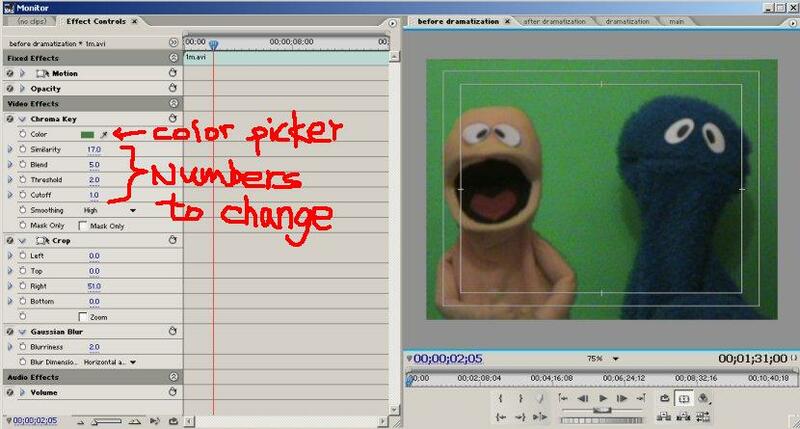 Our footage is not ideal, especially since it’s not intended to be a green screen shot initially. The Similarity setting allows you to set how much error you want to give in comparison to the green you picked. If this value is very small, only the pixels that’s very similar to the shade of green you picked will be keyed out. If this value is big, you will get rid of more different shades of green. Note that, when this number is too big, it will start to include colors like black and make Mac and Cheese’s mouth transparent. We don’t want that. The Blend is a variable that decides how much the two images blend together. A lot of this is trial and error. Here I included the results of a few different sets of numbers. Some of these look better than the others. Some of them have background that’s not completely keyed out. Some of them have parts that became transparent although it shouldn’t have. So play around with the numbers until you find the best result! Thats pretty cool stuff. I personally use After Effects for anything post effects stuff. I only use Premiere or Final Cut just to chop my footage up and editing. If you ever have After Effects in hand, use the Key Light plugin in combo with AE, you have greater control over your keying and matte. It also does most of the green splotches that you have automatically from the green light reflected from the screen. Yeah, After Effects is definitely on my list of things to learn. After all, that’s fun stuff and my site talks about editing a lot more than most puppetry sites.